• Cyclops is packed with juicy small copepods. The Cyclops are a genus of freshwater copepods which range in size from 500 to 1000 microns (0.5 to 1mm) in size and are an ideal food for small fish and corals. 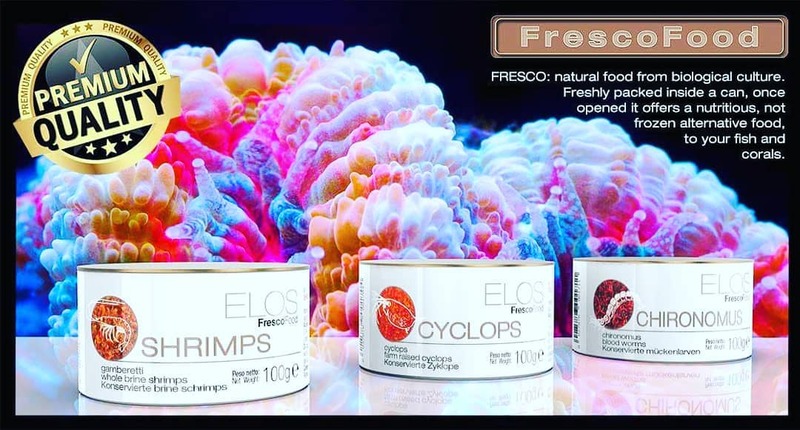 • Fresco Shrimp (Artemia) complete the new trio of foods. Each can of Fresco Food weighs 100 grams, or a 3.52 ounces. Please refrigerate the Fresco Foods after opening and use it up within 15 to 20 days. It can also be frozen after opening if preferred. ELOS America is based in Columbia, South Carolina, affiliated with ELOS in Verona, Italy, a manufacturer of aquariums, equipment, and supplies for marine and freshwater systems. Fresco Cyclops is a small species of Cyclopoid Copepods that range in size from 100-1000 microns (0.5 to 1mm) in size and is suitable for larval fish, invertebrates, corals, clams, seahorses and pipefish, and any smaller mouthed fish. Because this natural prey item is found in abundance in great ranges of salinity, Fresco Cyclops is a choice food for both marine and fresh water species. Our unique pasteurization process ensures that your tank is getting the closest to fresh possible with optimal nutrition in mind. We package using no preservatives, making Fresco Cyclops a highly palatable, and extremely clean “whole food” that will entice even the most finicky fish. All Fresco products are packaged in a whole animal, natural or moist form. No slicks, no clouding of the water – just the whole Cyclops with our proprietary vitamins and minerals. Feed daily or more often as needed. Adjust the amount given based on the number of fish being fed and how much can be eaten in a 5 minute period. Promptly remove any uneaten food. Refrigerate after opening and use within 10 days to 20 days or freeze. Offering these foods in a more natural state can be a more attractive food for tempting finicky and newly acquired aquarium fish. By pasteurizing the food in the can, Elos Fresco Food delivers a highly nutritious food, without losing valuable nutrients.